Who doesn’t love a comfy t-shirt? I mean, to dislike the tee would be akin to not liking, I dunno, puppies. Or babies. Or pie. Get the one I'm wearing,the Heart Arkansas Green Raglan Baseball Tee, here! To me, these tees make the perfect top for summer. Throw it over a bathing suit for the lake, sport it at the gym, dress it up with skinnies and a bold necklace for an evening out ‘n about…the sky is the limit. 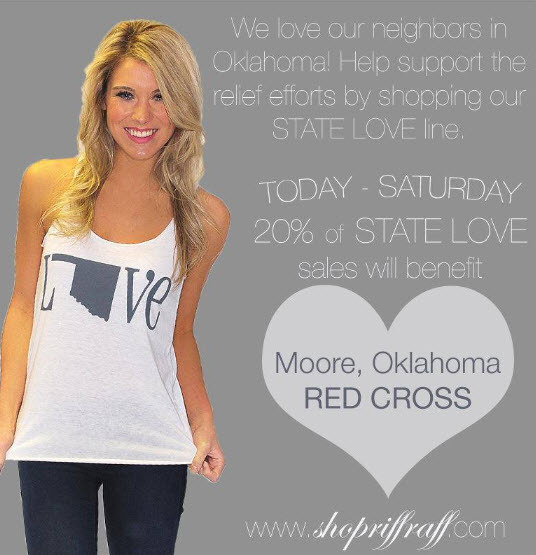 This week, (now - Saturday), Riffraff will donate 20% of sales on State Love shirts to victims of the OK tornadoes. Do some good and score a comfy shirt today, gals! These Tees are adorable, i love the idea of getting an oversized state tee to wear as a bathing suit cover up! Can't wait to check them out!!! Love your baby bump...Cee is totally showing!!! Wishing there was a cute state love tee for New York...I would order one. Riffraff has the most adorable stuff!! This is beyond cute! Such a great tshirt and a great way to show off your home state love! In love. I'll have to check them out when I get home. I love it! I want a CA shirt and I've seen them but if it goes to a good cause that's as good an excuse as any to shop. Actually, it's finally a really good excuse! Love these! I have the OKlahoma Love, but I'm thinking I need the baseball tee. I love a good comfy tee. I love them even more now that I'm running around chasing a baby most of the time. I really think the red cross donation is a perfect reason for me to scoop up a California Love shirt. I love the idea of pairing it with leggings & sneaks. Look at Baby Caroline growing! You look stunning, as always friend!